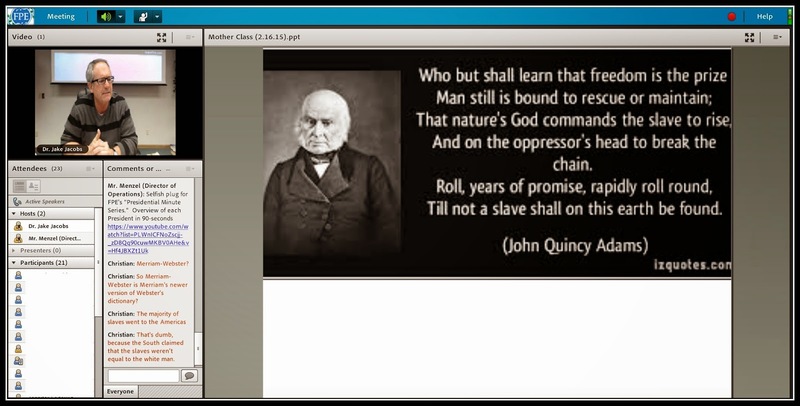 FreedomProject Education is an online classical-style academy with a philosophy firmly based on Judeo-Christian values. They offer regular Common Core Free courses for students of all ages, as well as "special event" courses for families of students 13 and up to take together. Their 2015 course offerings include Mother, Should I Trust the Government? presented by Jake Jacobs, PhD, which Luke and I were chosen to participate in. This course especially appealed to Luke because there were mandatory papers or exams; it appealed to me because of the cost. Although there is no tuition charged for these family courses, FreedomProject Education suggests a $50 donation per family to offset costs. The textbook for the course, Mother, Should I Trust the Government? is a book written by Dr. Jacobs. In it, he explores the history of American government. Dr. Jacobs challenges students to reject political correctness in favor of historical correctness, and to consider the establishment of our nation in the context of the then-current world views, not through our 21st century perspective. Beginning with understanding the perspective and intent of the Founding Fathers, and then later American Presidents, Senators, Governors, etc. is crucial for interpreting the role that government plays in society. Dr. Jacobs points out how a Christian worldview played in the founding of America. While our forefathers were of different denominational traditions, each was a product of his upbringing; it's impossible to conceive that the founding of our nation was based on atheistic principles. If anything, it was their belief in God as the ultimate King, as opposed to the king who ruled America from across the ocean, that played a pivotal role in text of the Declaration of Independence. As the class progressed through the sessions, we also progressed through American government history. Luke has been taking a US Government course, and this was a fantastic companion to it. What I especially appreciated was this wasn't just a "lecture" based on the book. The class was interactive, with the online students able to communicate in real time with Dr. Jacobs, and able to discuss concepts with him and the in-class students. (My only wish was that the audio from the in-person class was stronger, so that we could hear those students better. Some students remarked they could hear better with earbuds/phones rather than through their computer's speakers, but this wasn't an option for us because there were two of us taking the course.) 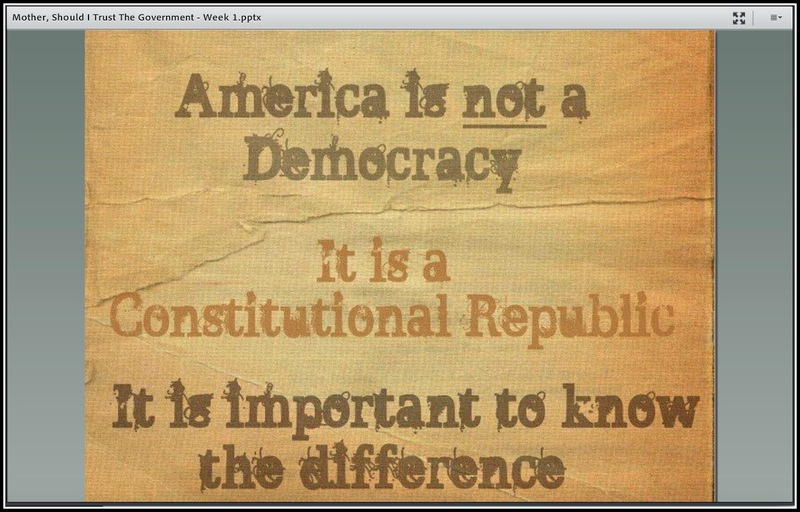 Luke's other course is purely lecture-based, and of course he's learned how the government works - three branches of government with checks and balances, the text of the Constitution, Bill of Rights, and Amendments, etc. However, it has a slightly "stale" feel, because it is a "just the facts, ma'am" program. Being part of a class with an instructor who has a passionate political view brought government to life for him. I think Luke summed up Dr. Jacobs well. He was honest and confident in his beliefs, but was adamant that in order for any progress to be made in this country, people had to be willing to at least respectfully listen to others' views, and see any merit there could be found in an opposing viewpoint. He readily identified himself as a republican (small r) - a person who believes in and supports a republican government. Luke liked that while Dr. Jacobs mentioned that he could identify with a "platform Republican," he also was very quick to point out when even his political opposite had a valid point to make. I think for Luke this was very eye-opening. Two of his co-workers are VERY vocal about how "their" party is the only "right" one, and this has helped give him a little more confidence to say "Ok, they've got a point, but..." and realize that politics isn't black and white. At sixteen, he's starting to develop his own political views, and is beginning to realize that he needs to start to pay attention to government in a way that isn't simply "learning who wrote the Constitution" but "how and why and what does it mean today." The first election Luke will be eligible to participate in will be the next Presidential race, and he's realizing there is more to responsible voting than just watching TV commercials. Dr. Jacobs recommended a LOT of extra reading and video watching to more deeply explore themes presented in the course, so as he listed things, Luke added them to a Pinterest board. Follow Meg @ Adventures with Jude's board Homeschooling US Government / Freedom Project Education on Pinterest. He'll be busy studying political science for a while! We live in a world where people are spoon-fed WHAT to think, but are seldom taught HOW to think. It is easier and far less demanding to be told what to think than to have to engage in the rational exercises of critical thinking and analysis. After being inspired by Dr. Jacob's call to action that he look deeper into the context of government, Luke is very interested in this class as well. Critical thinking skills are really going to be necessary to wade through the history of governments past and the politics of governments future. Mother, Should I Trust the Government? is a tongue-in-cheek reference to a Pink Floyd song, but in reality is a valid question. 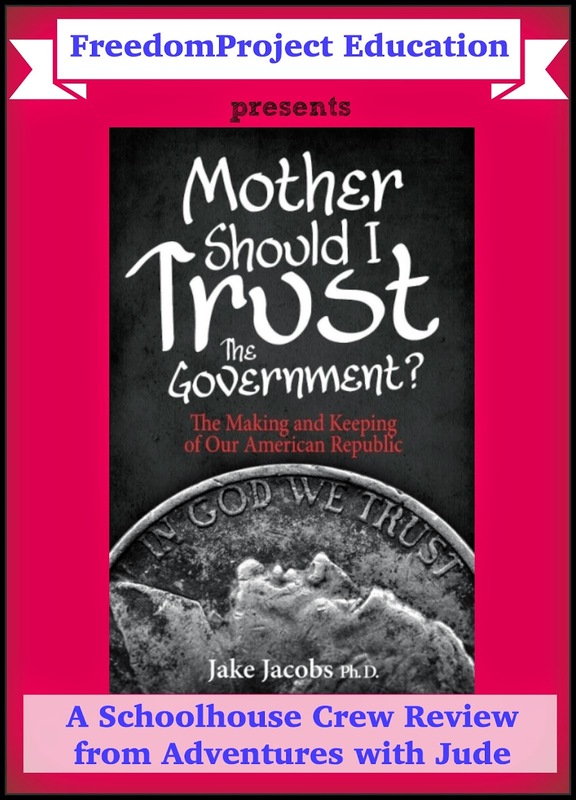 When Dr. Jacobs wrote the book, he showed the manuscript to his mother, who in turn took it as a real question and responded "NO!" After this course, Luke has learned that the government is only as trustworthy as those who are involved, and trust should never be given blindly.